Managing materials without a teacher’s desk! I got rid of my teacher’s desk a few years back when I had a large 5th grade class in a small room–we were so squished that year! I remember how nervous I was about doing so…I actually felt a bit sick over it and almost talked myself out of it! But I knew it had to be done. I mean, I am the worst kind of teacher-hoarder and all kinds of interesting items were lurking in those wooden drawers! But…I’ve been doing a HUGE decluttering of my room this year (actually it’s taken about two years!) and that hutch thing was starting to get on my nerves. It was so bulky and tall…and everything else is pretty low and uniform in the room, furniture-wise. So it was goodbye hutchy! A round table to take groups (or pile my junk, which I am still working on curbing!!!). For my supplies, I have plastic drawers (I think you may have seen some of these on here before, but I’m not sure). The cool thing about these drawers is they can stack three high and make a kind of countertop surface! So I made all of my supply labels with a little apple icon, to show they belong to the teacher. The kids are very good about not opening these unless asked. We joke about how 99.8% of the room is theirs to begin with!! I hope this is of some kind of help if you are thinking about removing a teacher desk. I have never regretted it and I feel like I have been able to fine-tune my organization more each year without it! I just got rid of my desk a few weeks ago due to SmartBoard/laptop locations. I would love to see a wide-screen pic of your drawers just to see how you have it all set up! I am currently using an entertainment cart (ha) as a laptop station. I have a 2 drawer file cabinet to my right and a 3 drawer cart to my left. I am using the entire counter space next to my sink for teacher storage too but so far everything is working out very well! I now have a HUGE open space for my kids to read in and I love that. Love this!!! Will you come do my classroom?! I have a desk but don't use it as a desk…it is my technology table. It holds my ELMO, laptop, projector, wireless keyboard. I use a kidney table as my desk/guided reading area and I have a bookcase behind it for my teacher stuff. I spent the afternoon cleaning out my desk with plans to finally get rid of it over the holiday break. While doing so I was planning my labels for my supply draw and thought "maybe I'll go round a la Ladybug." I have a desk but have been thinking about getting rid of it. I NEVER sit at it. My students have sat at it more than me and they feel so IMPORTANT when they get the chance to complete work at it. I only use it to stack up paperwork!! Hey Kristen – hmmm I cant decide what to do after seeing your post! I have a desk but it's in my trailer that I DON'T use! I teach small groups this year so I carry everything around in a tote bag (organized inside by bags, folders and small containers) but even that drives me crazy! Yes, Yes, Yes! More pics,please. I have tried everything under the sun but am still looking for just the right system of organization. Too funny that you posted this, I just got rid of my desk last week. The other 6th grade teachers thought I was crazy, but I am loving it. I am amazed at how much more room I have. I too have lots of clear drawers for storage, and I am actually planning on getting a few more over the holiday break. Luckily, I have a large bookcase near that I store lots of my essential teacher books and such on. I am getting ready to get a kidney table to meet with small groups, and when I need to sit, that is where I will be. I got rid of my desk when I taught elementary but when I moved up to middle school I brought it back. I just needed some space for myself, somewhere to leave my lap top and do my work. I love your labels!!!! I totally need to do that! Im not going to lie (i know i'm nuts) but I always have an itch to go to school during break (yes yes me, the one that counts the minutes till vacation) and work on my stuff and get organized. I am a label junkie too!! check out this post that shows just a snidbit.. I am contemplating giving my desk the heave ho. Would you post a few pictures of your whole "desk" area please? I had one of those collage dorm room desk that they sell at Walmart for $50.00. However, this year, it is more of a storage/ counter top area for me. I am using two smaller rectangular tables in the shape of an L. I love it. I use part of it for my materials and the other part for my small group instruction. Now everything is at my fingertips and I don't have to walk around looking for it. I love your organization. you made me laugh with the hot glue strands. What a riot. I love it! Thanks for sharing. And yes, post whole classroom pictures please! Thank you so much guys!! I will share more pics at the end of the week once we clear up everything for vacation. Right now it's a sea of glitter and construction paper!!! I gave you a shout out on my blog for your blends/digraph posters! I love, love, love them! I am looking for cute labels for newly acquired furniture (I wrote a grant and got EVERYTHING I asked for!) Is there a chance that you'd be willing to sell blanks? and some with the apple on it? I love these so much! I am slowly working mine out. Got rid of the "associate" desk this fall, moved my current part time help into mine (a smaller desk) and moved me to a "bean" table, a set of three drawers like yours and a couple of shelf units. Now I want to shove a few more things out! What an inspiration! Thanks. i bought colored boxes (photo boxes, office boxes) and labeled them. 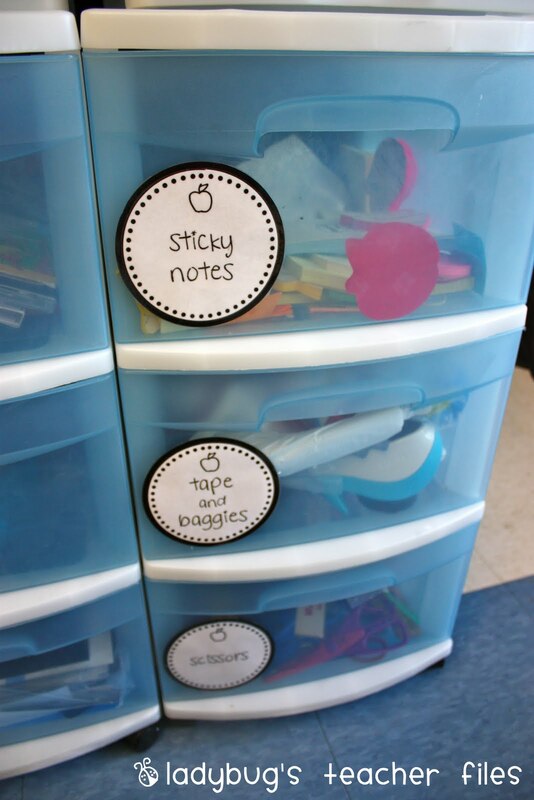 Stack them on a shelf so it is handy and looks nice and uncluttered in my classroom. I haven't had a desk for years because I noticed it was my catch all instead of a workable space for me. Do you have a round punch that cuts out your labels or do you cut them by hand or on a Cricut, etc? I LOVE them!! Kelley! Thank you very much, what a nice thing to do! I'm so glad you could use the file. Lori, what a brilliant idea! I love how those boxes look, what a great item for storage. I can't use my desk usually anyway since it always seems to be buried under a pile of things I need to do. Kristen, I got rid of my desk over the summer…along with A LOT of my kids desks as well! Instead we have lots of alternative seating options because how many kids do you know begging to stay seated in their desk all day? 😉 I LOVE your labels and would love to see more pictures of your room and I agree with Holly on seeing the overall area. On my blog I have pictures of my room without 20 desks, a letter for parents and administrators sighting research for this approach as well as lesson plans for implementing this into your room. I would love for you to check it out http://2ndgradeparadise.blogspot.com/search/label/Classroom%20Seating. Ps: I LOVE your blog and am definitely a follower! I got rid of my desk several years ago and do the exact same thing you do with your drawers. I found that my desk only collected more crap. And we all know that teachers don't need more crap! Thanks Jane! 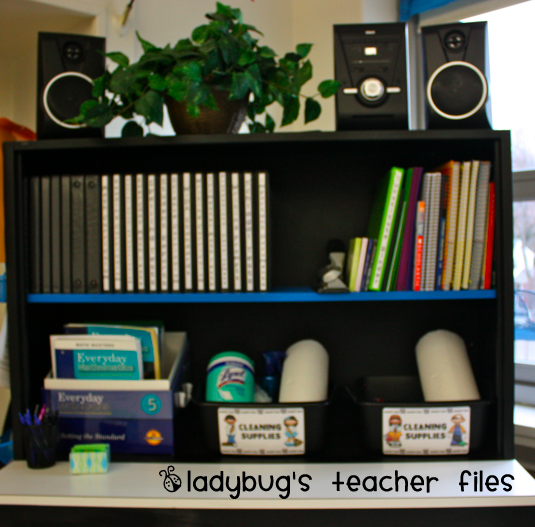 Stacy, I just stopped by and I love your blog posts showing your classroom!! Elisabeth, you cracked me up–this is so true! Great blog, by the way – I'm enjoying your videos! I LOVE this idea! By this time in the year, I'm noticing my supplies are trashed from student use. What fond did you use and where did you get that adorable apple icon? I love it! When I first started teaching at my current school several years ago I was baffled because there were no desks – just tables… It didn't take me long to fall in love with that approach. I also got rid of a proper desk and now I have a small, sleek one that attaches to a bookshelf (thanks Ikea). There are no drawers to collect clutter. I do have a few small storage containers to hold essentials. Everyone is talking about getting rid of their desk – for me the first thing that I got rid of was the filing cabinets. Most of my resources that would be in a filing cabinet are stored digitally with one copy in a binder. The drawers could too easily become dumping grounds so out they had to go. Thanks for all of your ideas everyone! I a, going to be a first grade aide in the fall and am looking for storage ideas. This is great. I would love to create the same labels you have. Any help with the font and graphics and layout would be tremendous! I look forward to hearing from you. Are these labels for sale in your store? I cannot seem to find them. Your site is a such a blessing : ) Thanks! Love this. I am still decluttering as well. I got rid of my desk last year. I just use my kidney table. We have laptops so my laptop stays on my kidney table or I move it to a shelf when I need to hook it up to the interwrite board. I use 3 drawer plastic bins as well and I actually use a cubby shelf which sits in the back of my table against the wall. On the cubby shelf I have students work, graded papers, etc. I use the top of the shelf for my files. Its still a work in progress but Im determined to declutter my room.